A pet dog saved the life of its owner and his family before their house collapsed in a landslip in Idukki district's Keerithode. The family members, who woke up hearing the groans and yelps of the dog at 3 am on 12 August, came out of their house just minutes before it caved in. While this family got lucky, thousands of other dogs and animals could neither save their or their masters' lives when the century's worst floods wreaked unprecedented devastation across Kerala. The hapless animals perished in landslides and floods while nearly a million people were shifted to relief camps. Some who tried to save their pets met a watery death. A nine-member family that tried to shift their relative's pet from a flooded house in Malappuram district was buried alive in a landslide on 17 August. A woman in Thrissur district was ready to risk her own life for the sake of the 25 dogs she tended to at her house. The woman, Sunitha, who was stranded in her flooded house, had refused to leave with rescuers without her dogs. She had left the house only after the animals were placed in the safe hands of Humane Society International (HSI). Rescue personnel carry animals and elderly people to safety from floodwaters in Kerala's Thrissur district. Shaju Ambarayil, a farmer from Madakkunnu in Wayanad district, remained helpless when the over 70 pigs he reared in a farm near his house were swept away by the floodwaters. He could not save the animals, his only means of livelihood, as he had to safeguard the lives of the six members of his family, including his aged parents. The floodwaters washed away thousands of animals, including livestock, while landslides in the hilly regions of Kerala killed many more. Animal lovers who embarked on a rescue operation since the floodwaters receded on Sunday saw bodies of hundreds of animals strewn all around many places. Kerala Veterinary and Animal Husband Director Dr N Sasi said they had no figures on the number animals killed in the floods. He said the department would be able to gather the details only after people in the relief camps returned to their homes. "Our current priority is to rescue the stranded animals and rehabilitate them," Sasi said. "We have opened 20 camps in various parts of the state to shelter the animals. We have pressed teams of officials with meals and medicines across the state to rescue them." Several animal rights groups have also joined the effort. Thiruvananthapuram-based Save Animals Kerala (SAK) has sent a team to Alappuzha with a boat, animal feed and medicines. G Karthikeyan, head of the team, said they had rescued about a 100 dogs and 75 other animals stranded in the backwaters in junkers. He said all the animals were sick and needed treatment for at least a week to be on their feet. "However, we don't have the facility to shelter the animals in Alappuzha. The owners will take the domesticated animals. We are trying to identify them and hand the animals over to them. But there are no takers for the street dogs. We are planning to take them to Cherthala, which is 40 kilometres from Alappuzha," Karthikeyan said. He added that they were also short of medicines to treat the rescued animals. If the animals are left untreated, they can also cause infections in human beings and trigger several diseases. To prevent this, Karthikeyan said they were in touch with animal husbandry officials to procure the required medicines. SAK coordinator Sreedevi said the biggest problem was finding a suitable place to accommodate the rescued animals, but a few people had offered their homes to provide temporary shelter to the animals. "We have opened three such centres in Ernakulam, Perumbavoor and Thrissur, but transporting the animals to these places has been tough as the roads are still blocked in many places," Sreedevi said. She added that a shortage in animal meals and fodder was also a significant problem. "All cattle grazing areas are underwater. We have opened a collection centre in the state capital, where people can drop meals for the animals. We hope many come forward to support them, considering the gravity of the situation," Sreedevi said. HSI has also deployed a team to the affected areas. A six-member team of experts is now in Malappuram, scouting for stranded animals. So far, it has found several who perished in landslides and floods. "Kerala is at a standstill right now, with many areas experiencing total devastation. Our team is encountering many animals who perished. However, we are still finding abandoned dogs and were recently able to rescue 13 dogs and a tiny kitten we found trembling as the floods raged around him," HSI said in a statement. 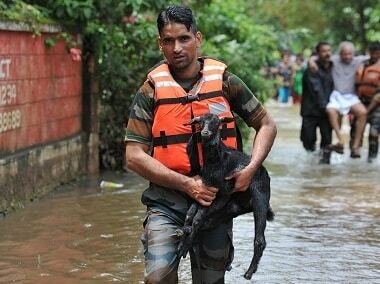 The animal rescue organisation said many animals have perished in the disaster, and that it is working with the Kerala government and the National Disaster Response Force (NDRF) to locate and rescue dogs, cats and other animals left behind after their owners were evacuated to safer places. NDRF personnel have also been trying to save the animals they marooned in the floods while rescuing people. A team had to struggle for six hours to rescue a pack of dogs stranded in an island in Idukki. Moreover, the veterinary director said there was urgent need to remove the bodies of the animals as they could cause diarrhoea and leptospirosis. He said a team of doctors has been deployed to disinfect the animals. Sasi added that the maximum animal casualties was in the districts of Idukki and Wayanad, which witnessed landslides along with floods. He said the department was paying special attention in these districts as they are major dairy farming centres of Kerala. The extensive damage livestock has suffered in the two districts will lead to an acute shortage of milk, he said, adding that extensive efforts were required from the government's side to revive the sector.